It may work for other people but it does not work on me that well. It does numb it so i can sleep the pain off. Easy to take if you have a hard time taking pills. Dose not work as will as i hoped. Chance of overdosing if not used right. Any time I have what I call my marathon headaches or cramps I actually go to Tylenol as a last resort. For some reason ibuprofin has forever been the only thing that has ever helped put a dent in my persistent pain. While Tylenol has sometimes come to the rescue, I cant say I ever go to it first as it has left me in the same amount of pain as I had been before I had taken it on many occassions. Its just as trusted as ibuprofin and comes in all varieties whether it is in cold medicine, nighttime meds or pain. Just doesn't seem to work for some people. It can also damage your liver if used over long periods of time. Tylenol is a great way to reduce any kind of pain you may experience. Back pain, foot aches, headaches, cramps, you name it. 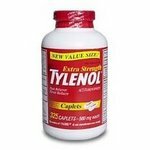 Tylenol works fast and is safe to use for all ages.